The in Maps atlas series was initiated by the President of Hungarian Academy of Sciences in 2005. The aim of the series published by the Geographical Institute (Hungary) is to introduce countries and macro-regions of Eastern Europe for the wider English speaking public. The goal is to offer complex regional geographic perspectives on macro-regions and countries, and present issues relating to nation, society, and spatial economic development. 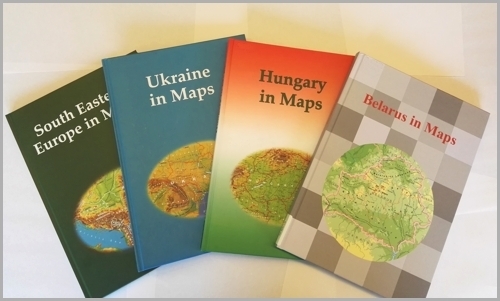 The series comprises the following volumes: South Eastern Europe in Maps (2005, 2007), Ukraine in Maps (2008), Hungary in Maps (2009, 2011) and Belarus in Maps (2017). In a departure from the traditional descriptive approach, we have sought to present countries and regions focusing on specific issues using case studies on the country or region to supplement general information about the geography of the country or region. These case study chapters summarize the findings of research conducted by the authors during field research work. Text boxes have been used to present additional issues in greater detail. In addition to maps and diagrams, the atlas is also illustrated with photographs on a geographical theme. With the present series the editors would like to foster knowledge and understanding among the nations, contribute to cultural and scientific dialogue and strengthen economic and social ties. We are also committed to continuing the in Maps series and make it available free of charge online for the public on the present website. We warmly recommend the in Maps series – which is richly illustrated with maps – both to geographers, economists and political scientists as well as to diplomats, politicians and investors. Ed. by Károly Kocsis. MTA Geographical Research Institute, Budapest, 2007. 137 p.
2nd, revised & expanded ed. Over the past fifteen years the explosion of the "Balkan powder-barrel" shocking the European continent deeply i.e. the fanning of ethnic-religious tensions (suppressed for several decades) into regional conflicts and warfare renewed traditional interests of the European public towards the countries of Souh Eastern Europe (the former member republics of Yugoslavia, Albania, Bulgaria and Romania). There has emerged a necessity to publish an atlas in the form of a book or a book combined with an atlas in which a large number of attractive thematic (physical, political, ethnic, religious, economic) maps, charts, tables completed by concise textual analyses provide explanation for the up-to-date societal and economic issues of South Eastern Europe and the most characteristic segments of the region's development in the 20th century. The publication produced in the Geographical Research Institute of the Hungarian Academy of Sciences (Budapest) serves as a brief account for public and scientific audiences and political decision makers on the region which largely belongs to the Balkans, with some countries as the primary targets of the enlargement of the European Union. The chapters are entitled by the main topics figuring in the book: the concept of South Eastern Europe and the Balkans; natural environment; territorial distribution by states; ethnic and religious patterns; urbanization and town network; the standard of economic development; spatial disparities; industry; energy; agriculture; transport; and tourism. Ed. by Károly Kocsis, Leonid Rudenko, Ferenc Schweitzer. Since the disintegration of the USSR, the Western world has had an ever-growing interest in Ukraine, its people and its economy. As the second-largest country in Europe, Ukraine has a strategic geographical position at the crossroads between Europe and Asia. It is a key country for the transit of energy resources from Russia and Central Asia to the European Union, which is one reason why Ukraine has become a priority partner in the neighbourhood policy of the EU. Ukraine has pursued a path towards the democratic consolidation of statehood, which encompasses vigorous economic changes, the development of institutions and integration into European and global political and economic structures. In a complex and controversial world, Ukraine is building collaboration with other countries upon the principles of mutual understanding and trust, and is establishing initiatives aimed at the creation of a system that bestows international security. This recognition has prompted the Institute of Geography of the National Academy of Sciences of Ukraine (Kyiv) and the Geographical Research Institute of the Hungarian Academy of Sciences (Budapest) to initiate cooperation and the volume entitled "Ukraine in Maps" is the outcome of their joint effort. The intention of this publication is to make available the results of research conducted by Ukrainian and Hungarian geographers, to the English-speaking public. The atlas follows in the footsteps of the previous publications from the Geographical Research Institute of the Hungarian Academy of Sciences. Similar to the work entitled South Eastern Europe in Maps (2005, 2007), it includes 64 maps, dozens of figures and tables accompanied by an explanatory text, written in a popular, scicentific manner. The book is an attempt to outline the geographical setting and geopolitical context of Ukraine, as well as its history, natural environment, population, settlements and economy. The authors greatly hope that this joint venture will bring Ukraine closer to the reader and make this neighbouring country to the European Union more familiar, and consequently, more appealing. Ed. by Károly Kocsis - Ferenc Schweitzer. Geographical Research Institute of MTA, Budapest, 2009. 211 p.
'Hungary in Maps' is a unique publication, it combines the best features of the books and atlases that have been published in Hungary during the last decades. This book provides a clear, masterly and comprehensive overview of present-day Hungary by a distinguished team of contributors, presenting the results of research in the field of geography, demography, economics, history, geophysics, geology, hydrology, meteorology, pedology and other earth sciences. The 172 lavish, full-colour maps and diagrams, along with 52 tables are complemented by clear, authoritative explanatory notes, revealing a fresh perspective on the anatomy of modern day Hungary. Although the emphasis is largely placed on contemporary Hungary, important sections are devoted to the historical development of the natural and human environment as well. In its concentration and focus, this atlas was intended to act as Hungary's 'business card', as the country's résumé, to serve as an information resource for the sophisticated general reader and to inform the international scientific community about the foremost challenges facing Hungary today, both in a European context and on a global scale. Examples of such intriguing topics are: stability and change in the ethnic and state territory, natural hazards, earthquakes, urgent flood control and water management tasks, land degradation, the state of nature conservation, international environmental conflicts, the general population decline, ageing, the increase in unemployment, the Roma population at home and the situation of Hungarian minorities abroad, new trends in urban development, controversial economic and social consequences as a result of the transition to a market economy, privatisation, the massive influx of foreign direct investment, perspectives on the exploitation of mineral resources, problems in the energy supply and electricity generation, increasing spatial concentration focused on Budapest in the field of services (e.g. in banking, retail, transport and telecommunications networks), and finally the shaping of an internationally competitive tourism industry, thus making Hungary more attractive to visit. This project serves as a preliminary study for the new, 3rd edition of the National Atlas of Hungary, that is to be co-ordinated by the Geographical Research Institute of the Hungarian Academy of Sciences. Eds. Dávid Karácsonyi, Károly Kocsis, Zsolt Bottlik. Geographical Research Institute CSFK MTA, Budapest, 2017. 194 p.
The Republic of Belarus, one of the larger European successor states of the Soviet Union, first appeared on the political map of Europe in 1991. Even today, Belarus is barely known to many European citizens, and the sporadic information provided by the media is not always free of bias. Several factors, however, indicate that Belarus deserves greater attention. The country lies in the buffer zone between two huge cultural realms that have clashed several times during recent centuries, leaving a lasting impact on the people, landscapes and heritage of the region. Belarus remains a transit country of geopolitical importance: viewed from Russia it is a window to the western part of Europe, while looking from the other side it is a gateway to the East. Belarus is also a country in transition, seeking its own development by means of a unique economic model that is based on the political and economic power of a centralized state. So far, Belarusian model has proved remarkably successful. Recognizing the need to provide a factual, up-to-date and comprehensive overview of Belarus for both the scientific community and the broader public, Hungarian geographers commenced a complex research program in close co-operation with fellow geographers in Belarus. The result of their collaborative efforts is this atlas, which constitutes a further addition to the "in Maps" series initiated by the Geographical Institute of Hungarian Academy of Sciences in 2005. 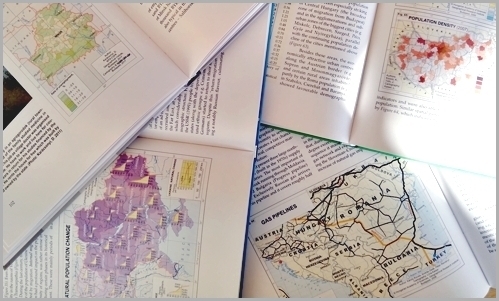 Like its predecessors, Belarus in Maps combines the features of a book and an atlas. The ninety-eight full-color maps and diagrams are complemented by authoritative explanatory texts written by a distinguished team of contributors from both countries. Beyond the usual topics of physical and human geography, separate chapters address issues of specific importance for Belarus, offering insights into the ethnic processes that led to the emergence of the Belarusian nation, the background to the Belarusian economic model, and the lasting impact of the Chernobyl disaster. Available in both printed and electronic form, Belarus in Maps is destined to serve as an abundant source of information about the country and as a standard reference work for many years to come. The atlas may also function as a kind of "business card" for Belarus, familiarising people around the world within this fascinating young country. Box 1.1 Belarus, Byelorussia or White Russia? Box 4.1 Lieĺčycy district - Potential tourist region eclipsed by Chernobyl? © 2017 MTA CSFK Geographical Insitute. All rights reserved.